Bring a large pot of water to boil over high heat. Salt generously. Place the lobster on a cutting board and stun it with a hard blow to the head using the back of a knife. Drop the lobster headfirst into boiling water, then cover, and bring back to a full boil. Uncover and simmer for approx. 4 min. Meanwhile, prepare an ice bath in a large bowl. 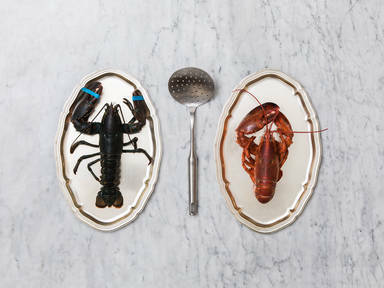 Remove the lobster from the pot with a slotted spoon and transfer to the ice bath to prevent cooking further. Once cool enough to handle, remove the rubber bands from the claws, and enjoy!